Raja Mohamed Affendi making a courtesy call to His Highness Brigadier Shaikh Nasser bin Hamad Al Khalifa ( Commander of Bahrain Royal Guard) in conjunction with BIDEC 2017. Manama, Bahrain: Malaysia’s participation in the Bahrain Defence Exhibition and International Conference (BIDEC) 2017 for the first time from 16-18 October was one of the series in promoting the Biennial Defence Services Asia (DSA) which will be held in Kuala Lumpur, April next year. The Malaysian delegation was led by the Chief of Malaysian Armed Forces (MAF), General Tan Sri Raja Mohamed Affendi Raja Mohamed Noor who was also given the honour to deliver a speech on “Security Challenges and Opportunities” in the Middle East Military Alliances and Coalitions Conference (MEMAC) held in conjunction with BIDEC 2017. During BIDEC 2017 which was officially opened by His Majesty King Hamad bin Isa Al Khalifa of the Kingdom of Bahrain, Malaysian senior officials had witnessed the signing of documents by Leornardo Company, Italy which will be participating in DSA 2018. Series of meetings and discussions were conducted by Secretary of Defence Industry Division, Wan Mohd. Asraf Wan Salleh and DSA General Manager, Anita Jacobson with various companies and amongst them were Pakistan Defence Industries; Military Industries Cooperation, Saudi Arabia; Saden Al Raba Holding Group, Saudi Arabia; Rosoboronexport, Russia and Jordan Defence Industry. According to a statement released by the Ministry of Defence, Malaysia’s participation in BIDEC 2017 was the idea and initiative of Defence Minister Datuk Seri Hishammuddin Tun Hussein, who is also the Minister with Special Functions, to strengthen the relationship between Malaysia and the Gulf countries (GCC) especially Bahrain. Seven companies participated in BIDEC 2017, including Defence Services Asia (DSA) Sdn. Bhd. which acted as the coordinator, EN Projects (M) Sdn. Bhd. (LIMA ’19) Boustead Holdings Berhad, Wester Defence Industry, DRB-HICOM Defence Technologies Sdn. Bhd (DEFTECH), Destini Bhd. and System Consultancy Services Sdn. Bhd. 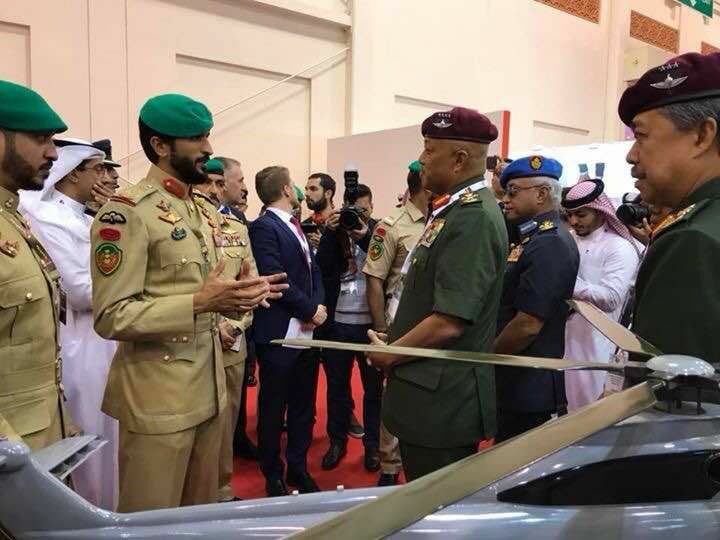 BIDEC 2017 was also the first international defence exhibition hosted by the government of Bahrain with the participation of 180 exhibitors from 39 countries.